Two workshops in a row! After a wonderful day in Rockingham yesterday, we had the privilege of visiting West Morley Primary School today to install the boxes you can see above in trees around the school. It was so encouraging to spend time at a school that had invested so much energy into nature play, planting local native gardens, and valuing local wildlife! Thanks to Emma and all the teachers for making our visit so enjoyable! When you find out a school has a resident population of Forest Red-tailed Black Cockatoos, and a 'peace garden' composed of native vegetation, you know the students are probably well ahead in terms of environmental education! It was a pleasure to work with Orange Grove Primary today for another workshop which focused on building cockatoo boxes to hopefully encourage breeding in the resident red-tails. After a presentation to the whole school at their morning, assembly we began construction with students from the Year 5 class, who assembled 3 cockatoo boxes. These were installed in some fantastic tall eucalypts around the school, including a giant Rose Gum (Eucalyptus grandis) at the edge of the oval, as well as some beautiful native Marri (Corymbia calophylla) trees at the front of the school. This project was funded by the local building company Boral, and coordinated by Conservation Volunteers Australia (thanks so much to Katie for all her hard work in organising the day!). Today a group of keen bird-boxers gathered at Hollis Park in the City of Fremantle to build some nest boxes for local parrot species (especially Australian Ringnecks, and hopefully not invasive Rainbow Lorikeets!). This former landfill site has seen a great deal of restoration works in the form of planting and rehabilitation by the local Friends of Hollis Park. The weather was very warm but a nice shady spot beneath some trees helped us brave the heat and humidity! We made 6 parrot boxes in total, with 3 being installed in Hollis Park and 3 at the nearby Clontarf Hill. If anyone would like to provide feedback or observations of fauna seen inspecting the boxes, please post your comments below. 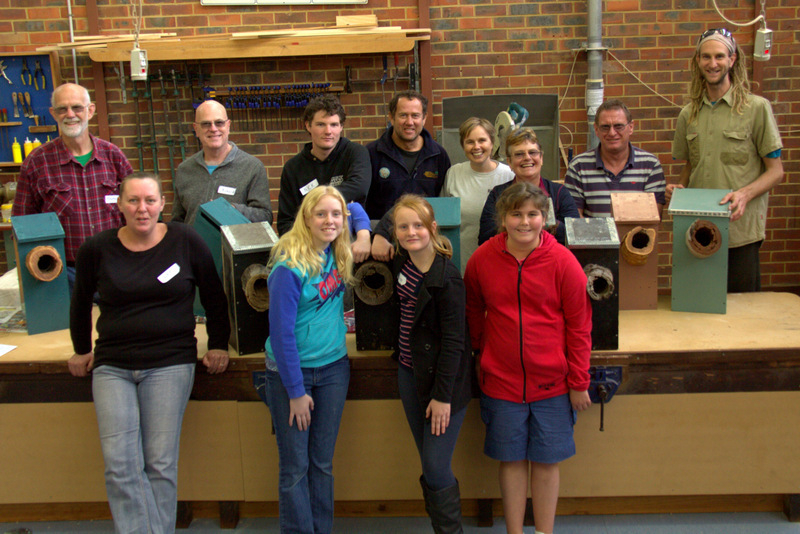 We have recently completed two nest-box workshops run in conjunction with the Mundaring Shire as part of their Bushfire Recovery Program. These workshops saw a happy bunch of fire-affected residents from Stoneville, Parkerville and Mount Helena learn a new set of skills in how to build and install nest boxes for their own backyard. All attendees got to take their own nest box home and we had some very positive feedback, suggesting everyone had a great time! Attendees at the post-fire recovery nest box workshops had a great time. Today we visited the Canning River Eco Education Centre and ran another nest box workshop as part of Nearer to Nature's school holiday program. You can read more about some exciting observations we made on Simon's blog here. TRAYNING! Today we had some great fun visiting Trayning Primary School in the WA Wheatbelt and getting back into the swing of workshops, conducting our first one since February this year. We worked with a brilliant bunch of kids who were all so well mannered, and super keen to learn about Australian birds and tree hollows. They were very excited to have a few different designs to work on (bats, parrots, pardalotes and a cockatoo) and had a great time at the end of the day painting each box under the shade before we installed all 6 in some very pretty gum trees in the school grounds. Thanks to Glen Buder from the Shire of Trayning/Nungarin for organising this workshop, and of course to the teachers and parents at Trayning Primary for having us attend the school. We know the kids had as much fun as we did!